And the winners of what wants to be the Academy Awards of design are as follows! 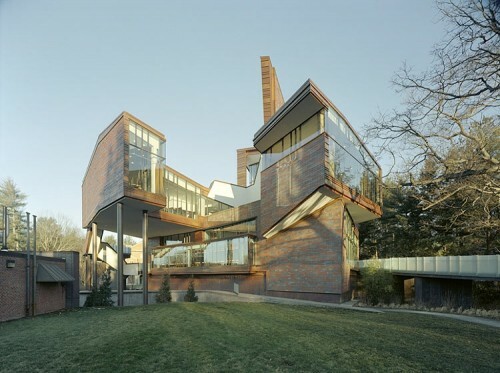 The Cooper-Hewitt’s ’s 2012 National Design Award in Architecture goes to Mack Scogin and Merrill Elam in Atlanta. We love the factory for Herman Miller and the Lulu Chow Wang Campus Center for Wellesley College is very cool, too. The Landscape Design award goes to Boston-based Stoss Landscape Urbanism whose interest in infrastructure at such projects as Erie Street Plaza in Milwaukee—part-civic, part-storm-water drainage—is so on message. Totally groovy LA architect Clive Wilkinson Architects wins for his interiors; his clients—Google, Nokia, 20th Century Fox, Disney—are running the world of infotainment! It’s important to know much more about interactive design so study up on the projects of the winner in that field, Evan Roth—doesn’t matter where he’s based, right?—who has harnessed free software and a “hacker ethos” on projects for Laser Tag, White Glove Tracking (with Jay-Z), and the open source Free Art & Technology Lab. Tutor alert! Thom Browne won Fashion and Design and MIT Media Lab’s Design that Matters won corporate/institutional. And now for all you six-degrees-of-separation theorists, here’s the list of the jurors: John C. Jay of Wieden+Kennedy; Michelle Berryman of Echo Visualization: Jeanne Gang of Studio Gang Architects; Lee F. Mindel of Shelton, Mindel & Associates; Melody Roberts of McDonald’s Corp; Eric Rodenbeck of Stamen Design; Behnaz Sarafpour; Alice Twemlow of D-Crit at the School of Visual Arts; and Charles Waldheim, from the department of landscape architecture at the Harvard University Graduate School of Design. The big news this year is that the Cooper-Hewitt dispensed with spending a lot of time dwelling on all the finalists; worthy as they may be, a time-consuming distraction. The gala ceremony—one of Fall’s major nights out—will take place on October 17 at Pier Sixty. Cooper-Hewitt Director Bill Moggridge is very pleased, and said so in a press release: “The National Design Awards program is Cooper-Hewitt’s largest and most widespread educational initiative and celebrates the full spectrum of American design practice. The provocative work of this year’s winners truly shapes the way we experience the world.” Agreed!